It's hard to believe, but summer is nearly over and soon enough the leaves will be changing. Fall in Vermont is undoubtedly beautiful and the crispness in the air serves as a reminder that winter is on its way. 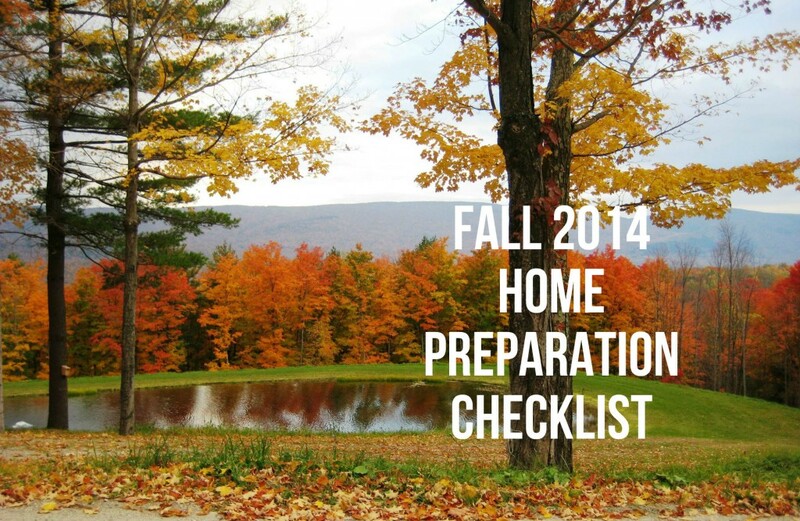 As the seasons change, so do our home and property needs. We always suggest taking advantage of the still longer and warmer days to do a little fall preparation and seasonal maintenance. As we Vermonters know, the weather can change quickly and being prepared is critical. A little extra work now will save you on last minute repairs and stress later. Check for drafts. Feel for drafts around the edges of windows and doors. A good tip is to use a lighted candle and if the flame flickers, there's most likely a draft. If necessary, replace seals and repair caulking around window and door frames. Consider buying heavier or insulated drapery for especially drafty windows. Have your furnace inspected. Hire an HVAC professional to test for leaks, check heating efficiency, and change the filter. They can also do a carbon monoxide check to ensure air safety. It's also a good idea to stock up on extra air filters and change them every few months. Winterize air conditioning. If your home has central air conditioning, cover your outdoor unit for winter. If you use window air conditioning units, remove them to prevent air leaks. Programmable thermostat. Buy a programmable thermostat, if you don't have one. If you already have one, check the temperature settings. Setting your thermostat to lower the temperature automatically at night and when you're not home, can result in substantial cost savings. Some models can now be controlled remotely through your phone! Test home safety devices. Replace the batteries in all smoke detectors and carbon monoxide devices and test to make sure they're working properly. Remove screens. Take down window and door screens to prevent winter damage. Make any necessary repairs and store away for next season. Do a roof check. You should be able to do at least a visual inspection of the roof from the ground. Grab some binoculars to get a closer look or if you're able and can do so safely, climb on up for a better view. Look for missing, damaged, or loose shingles. Remove leaves and debris with a roof sweeper. Stock up on firewood. Order enough firewood for the season. If you gather your own firewood, make sure it's dry and ready. It's best to cover firewood and store away from the house for safety reasons. Of course, be careful when cutting, stacking and hauling the wood. Inspect siding. Check home exterior for cracks or holes. Clean the gutters. Remove leaves, nests, and debris from gutters and check for leaks. Turn off faucets and store hoses. Drain garden hoses and disconnect from the outside spigots. Shut off exterior faucets, and if you have an older home, you may need to turn off the valve inside your home. Store hoses in a dry place so any residual water won't freeze. Trim landscaping. Cut back bushes, shrubs, and flowers and thoroughly weed your gardens. Plant bulbs. If you plant bulbs for spring, now's the time to get them in the ground. Fertilize lawn. Applying fall lawn fertilizer will help prevent winter damage and spring weeds. Ask a local garden center or check online to find out which type of fertilizer you need and when to apply it. Organize the shed. As your shed is filling up with summer items in storage it's a good time to organize and clean out the shed. Move summer items to the back and winter stuff up front for better access. Also, remove any liquids that will freeze. Arrange for snow removal. Find a company (or friend/neighbor) to plow your driveway, and shovel if necessary. Get your name on their list before the snow flies so you'll be taken care of right away. Service summer power equipment. Empty fuel and clean lawnmower and trimmer. Have lawnmower blades sharpened and oil changed. Have any necessary repairs done now, so that you're ready come spring. Store summer vehicles. If you have a motorcycle, summer car, ATV or other type seasonal vehicle, now's a good time to have that serviced as well. Get winter equipment ready. Service snow blower and make sure it is ready to go. Test the generator. If you have an emergency generator for power outages, give it a test, and make sure it's in good working order. Buy extra gasoline. Purchase extra gas to have on hand for use in your snow blower or generator, so you're prepared for emergencies. Make sure you store gasoline in tanks away from fire sources and out of children's reaches. Clean the garage. Since you're in the garage prepping for fall, you might as well purge, organize and clean it while you're there! Ready or not, fall is on its way. Properly maintaining your home enhances its value and appeal and is less effort than managing a crisis later.